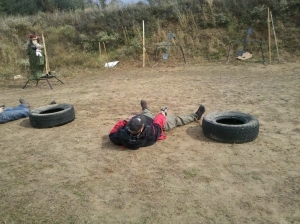 Level II Handgun builds on the techniques learned in Level I, with a focus on one-handed gun manipulation and increased difficulty in drills and scenarios. 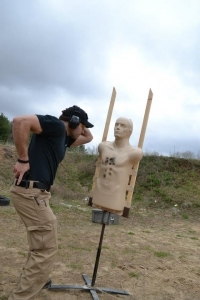 Equipment required: Functional handgun, .380 caliber or larger. At least 3 magazines or speedloaders. Proper holster and magazine or speedloader carrier. Flashlight. Secondary/back-up gun, with proper holster. Folding knife. Ammunition requirements: 800-rounds factory ammunition. One-handed and support-side stoppage reduction and reloads. Laws regarding handgun ownership and carry rights vary greatly from state-to-state and each jurisdiction has its own rules and regulations. Fortress recommends that you consult with your own state’s Attorney General’s office before purchasing any firearm, or before you attempt to carry a handgun. Many find http://handgunlaw.us/ to be a good resource, as well. Please remember that laws and statutes regarding firearms change almost daily throughout the United States; it’s up to you to know the law!